Published: March 25, 2015 at 11:45 p.m. 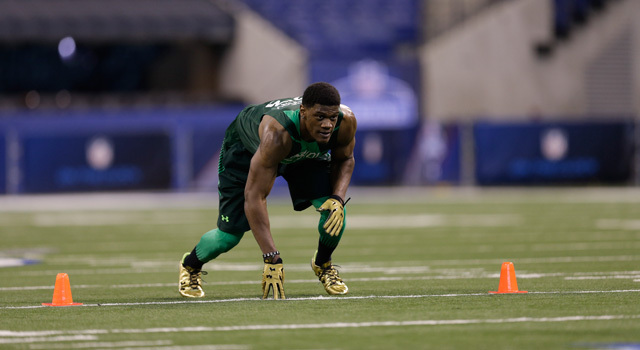 Updated: March 26, 2015 at 07:06 p.m.
ATLANTA -- If the evaluation process were solely about talent, Randy Gregory almost certainly would be a top-10 pick in next month's NFL draft. There's little doubt about that. But with the draft five weeks away, the former Nebraska star suddenly has another issue to address: He tested positive for marijuana at the NFL Scouting Combine in February. Gregory revealed the positive test to NFL Media on Wednesday afternoon in an interview at his agent's home office in suburban Atlanta. "I blame myself," Gregory said. "And I know it sounds cliché, but there's really no one else I can blame." Gregory officially learned of his failed test about two weeks ago, during a phone call with his father. Believing he had received a letter from the NFL inviting him to attend the draft, Gregory asked his father to open the envelope. It wasn't a draft invitation. "It said I failed a drug test," he said. After absorbing that punch-in-the-gut phone conversation, Gregory knew, perhaps immediately, that his draft stock could be affected. "Am I worried? Yeah, I'm worried," he said. "At the same time, I'm confident. I know I'm going to be all right in the end." Gregory, a 6-foot-5, 243-pound pass-rusher who had 17.5 sacks in his two years at Nebraska, is the kind of versatile athlete -- he can rush the quarterback and drop into coverage -- that teams covet. But marijuana is neither a new nor uncomplicated storyline in Gregory's life. At the combine, executives from two NFL teams indicated to NFL Media that there were concerns about Gregory's Nebraska off-the-field "issues." And this was before Gregory's positive test from the combine came to light. Gregory said he now believes he is "in a great spot," but getting there has been a process. "I don't wake up every day saying, I'd really love to go smoke," he said. "It's not a struggle for me every day (now), it really isn't. In the past, hell yeah, it's been a struggle. It really has been. Now, I'm focused on my dream." Gregory said he first smoked marijuana after graduating from Hamilton Southeastern High School in Fishers, Ind., and before enrolling at Arizona Western Community College in 2011. He had failed to qualify academically at Purdue, which represented a considerable disappointment to him, and Gregory said he turned to marijuana to cope with the anxiety. Gregory said he has not smoked marijuana since December, but because his THC levels were so elevated, the drug remained in his system at the combine. Thus, the positive test. "I was worse at Nebraska than I've ever been at any other time of my life," Gregory said. "But I know how I am now. I think if teams really look at how I am now more so than the past, they'll see I'm making strides to get better, as a person and as a player." "At the end of the day, it was my fault. I was being selfish. I was being stubborn. I felt like I could do things my way and it would work. And it didn't work." Last month at the combine, Gregory said he spent time with 29 teams in formal and informal interviews. In all 29 sessions, he said, his marijuana use at Nebraska was discussed; if the team didn't bring up the subject, Gregory said he did. "Obviously this is new news -- that I failed the test at the combine -- but the fact that I've smoked in the past isn't a mystery," Gregory said. "I've had conversations with (NFL) coaches. I believe we all have an understanding of why I did it. But I feel like I'm improving. I know I am." Gregory is adamant that marijuana is the only illegal drug he has ever used. "I don't want my career to be defined by the fact that I had failed a drug test or anything of that sort," Gregory said. "I want people to remember me as that top-10, top-five (draft pick) that had a 10-year career, a number of championships. I want to be known as that guy. I don't want to be known as a bust or that guy who came in (to the league) with a drug habit." Gregory said life without marijuana is "clearer" and added, "People also get to see how I really am instead of me walking around like a zombie or something." He also understands that some people will be skeptical. "I want people to really understand that I know I made a mistake, for one," Gregory said. "That I knew what I had coming up (the combine), and I still made that mistake. That was dumb. "I want people to understand I'm not some dumb jock pothead. I'm not," he added. "I'm intelligent. I love the people who help me, I love my family, I love my support group. I love football. I love winning. And I don't want to be labeled as some bust that couldn't make it because he smoked. And I won't be labeled as that. "So I just want people to understand that. This may be a setback. You may look at me a certain way, but at the end, I'm still going to be on top. I'm still going to do well." How this affects Gregory's draft stock cannot be known yet. Gregory said he receives great support from his family (parents Ken and Mary Gregory and his brother, who is in seventh grade, live in Michigan) as well as Gilmore and the agent's surrounding cast. Gregory also understands the team that drafts him next month may do so while crossing its fingers. Because of his failed combine test, Gregory will come into the NFL already in Stage 1 of the league's substance abuse program. "I'm sure there are some guys who can do it, who are successful and still can smoke," Gregory said. "But I don't think I'm one of those guys. In order for me to be successful, I put it down." Gregory seems to appreciate that it will take action, not words, to prove he can stay away from the drug. He said he knows "everyone's going to judge me. But they're entitled to their opinion." In the coming days and weeks, Gregory will make pre-draft visits to multiple teams. He wants to show that he has the athleticism to play defensive end in a 4-3 scheme or outside linebacker in a 3-4. "I'm trying to set myself apart from all the other edge rushers in the class," he said. "I want a team to draft me and feel like this is a guy we can put anywhere on the field and he's going to help us." First, there surely will be a new round of questions about his drug use. Gregory was pleased to learn Wednesday afternoon that former Jets and Chiefs coach Herm Edwards has agreed to mentor him. And in Gilmore, his agent, Gregory has a committed advocate. Gilmore plans to share with every NFL team a "detailed plan" that he believes will help to ensure Gregory continues on the right path. "I've seen him make great strides," Gilmore said. "This is a good kid, a good family. ... This is a (societal) issue, not just an athlete issue. Am I trying to make allowances for anything? No. All I can tell you is, I've seen this man improve leaps and bounds." Gregory calls playing professional football "a dream." But before he even enters the NFL, his career may be at a crossroads. "(Marijuana) could end my career," he said. "This incident right now is a step toward ending my career. The last thing I want to do is fail another drug test and be out of the league. "I want it on the record. I want people to understand I know I messed up. I'm owning up to it. I realize it. But at the same time, I'm taking the right steps to get better and to fix it."